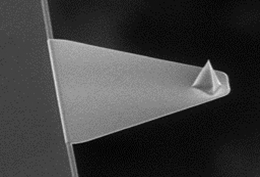 FastScan-B probes are designed specifically for imaging in fluid on the Dimension FastScan AFM. They deliver extreme imaging speed without loss of resolution,loss of force control, or added complexity. With the ability to perform 20x to 100x faster scans, these probes provide users with more high-quality data at a considerably faster rate,with little added operational cost. The FastScan-B cantilevers utilize a novel 30 um long triangular Silicon Nitride cantilever to achieve a 450 kHz resonant frequency with only a 1.8 N/m force constant. 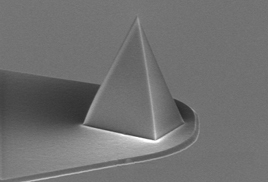 The Silicon tip has an extremely sharp 5 nm tip radius, making it ideal for imaging a wide variety of hard and soft materials. All FastScan cantilevers have less that 3 degrees of cantilever bend.Using this probe on an AFM other than the Dimension FastScan is not recommended and will result in sub-optimal performance. In July 2015 Bruker implemented a new process to achieve higherquality and consistency in this probe's physical appearance anddimensions. Our goal is to provide improved user results in consistencyof rendered resolution and less variation to instrument settings. Wewould like to hear your feedback on how these improvements have affectedyour results. Please contact us and let us know!